Tennis ball drive a bouncing success! 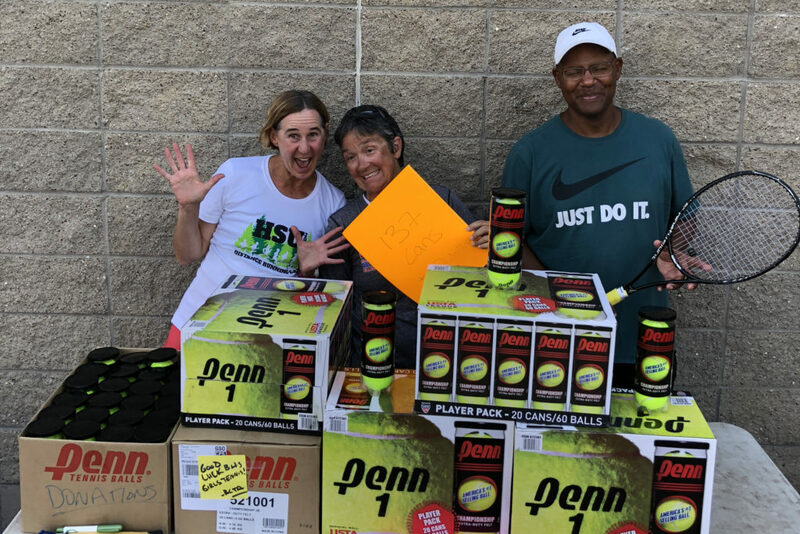 BHS Girls Tennis Coach Melanie Voss, Assistant Coach Jojo Donetti and Tennis Clinic Pro Calvin MacCullough with all of the new balls donated to the high school tennis teams. Our Labor Day clinic and “ballraiser” for the Benicia High School girls and boys tennis team was a bouncing success! Before the “ballraiser” the girls tennis team barely had enough balls to make it through the next couple of practices, let alone the entire season. Now, thanks to generous community and BCTA members, both the girls and the boys tennis teams have the ball supplies they need for the entire year! We received 157 cans of new balls, 120 gently used balls and $70 to buy more! A huge thank you goes to Coach Calvin MacCullough and his Assistant Tennis Pro Kristina for donating their time and knowledge to everyone who came out to their free three-hour clinic. It was a hot, tennis filled afternoon and could not have been better! ← Save the dates! Professional tennis comes to Fairfield October 6-14!